Below is an item about AmsOil's racing team dominating in the "cold country." Synthetic lubricants work superlatively down in Florida, too. Maybe it's some "left-over" advantage AmsOil gets from MP (Metal Protector), a top selling AmsOil product (It does the same as other light oils, but does it better and it is also an excellent metal protector). 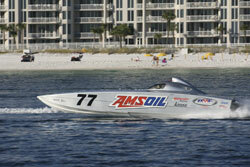 The picture above shows one of the Team AmsOil boats winning a race. But they weren't finished winning. "The POPRA races were held on were combined to determine the final finish positions. During Wednesday's race, Team AmsOil dominated on the 6.8-mile, rough water course, winning in the P-1 class and the overall. (There were three classes racing on the course at the same time.) The next POPRA race was held on Saturday on a smaller, 4.8-mile course that featured tighter turns. Team AmsOil once again dominated the P-1 class and the overall. The two first place finishes established Team AmsOil as the POPRA World Champion in the P-1 class."